Deciding to include children in your wedding party may seem like a bit of a scary and unpredictable step, but little ones dressed in gorgeous frills and sporting flowers in their hair can add an incredibly special dimension to a wedding and especially to the wedding photographs. Here are a couple of points to consider while making your decisions. The flower girl should be an adorable little miss between the ages of three and eight. She should be someone that you, or your fiancé, have a special relationship with. 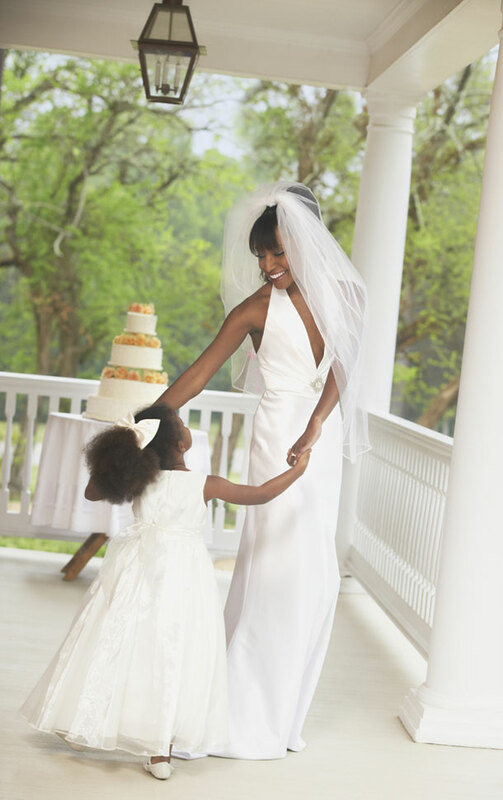 Little girls know that being in a wedding is a huge honour, so expect lots of excitement when you ask her! While you can pretty much choose exactly what it is that you would like your flower girl to do, flower girls usually precede the bride down the aisle, scattering rose petals or confetti or even blowing bubbles. After the ceremony they also often hand out the confetti. Having two (or three or four) flower girls might seem even scarier, but because the girls are little you might find that they are braver and more confident if they can walk down the aisle with a buddy. This choice might be made for you by default anyway, because if you have more than one adorable little niece / godchild / stepchild you might have to make space for all of them instead of choosing just one. It’s best to allow the little girls in your wedding party to be part of things like your kitchen tea or rehearsal dinner. That way they will become familiar with the other members of the wedding party and will be more comfortable on the day. Keep this in mind when choosing their dresses. Leave these until the very last minute if possible. Remind the girls often and clearly of what they are supposed to do. Ask them to repeat it back to you to make sure. It also helps if you make sure that their parents know what to do so that they can coach them a little bit on the day as well. Asking a little girl to be in your wedding means that you have secured yourself a friend for life. Don’t forget to thank her and let her know just how special she is and how much you appreciate her being there for you on your big day! I may have to include over 15 if I don’t want to leave anybody out! Yikes!! !